Soft sided cooler bags are a wonderful alternative to hard coolers. The best soft sided cooler options are much lighter and easier to carry than their hard cooler counterparts. They’re great for the casual outdoor type or a day at the beach. They can also be taken on a fishing trip, to the park, gym, while golfing, or even to shop for frozen goods and keep them fresh while you do the rest of your food shopping. Another use for them is as a carry on bag to be stored on an aircraft. Later on it can be used for its intended use as a cooler bag when you arrive at your destination. However, selecting a soft sided cooler can be tough. There are lots of names on the market, and they all make wild claims about how long they can keep things frozen, and how great their product actually is. That’s why we’ve put together this post, so you can figure out which one is actually worth spending your money on. Read on so that you can get a good idea of the best soft sided cooler bag that is right for you! So Why Choose A Soft Side Cooler Over A Standard Hard Shell Design? We all love our hard sided coolers. Perfect for a tailgate party or taking to the practice field but for less formal use where you might be walking a soft sided cooler bag is hard to beat. Here’s why. Soft cooler bags are just way lighter than their hard side counterparts. As drinks and snacks get consumed you can really feel the cooler get lighter, especially if you’re moving around. This kind of follows on from the above. They’re lighter but they also incorporate shoulder straps or other more comfortable means of being transported. Not all hard case coolers have wheels. Once you’ve finished using a cooler bag you can easily stuff it into a shallow draw or similar. You’re not left with a huge box to store. Out of the 3 cooler bags we’re reviewing today, the Homitt 30 cans soft pack cooler bag is the most affordable. 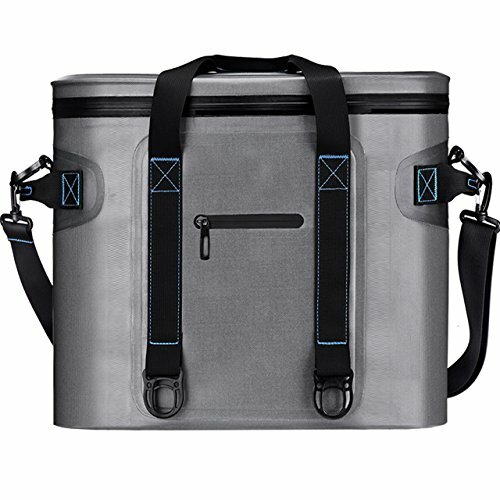 This doesn’t mean it’s cheap, just that compared to many other cooler bags on the market it won’t put as much of a dent in your purse or wallet. The bag has two ways to carry, which makes it super easy to transport from place to place and suitable for a wide range of activities. The Homitt also claims to have advanced insulation with no sweat design technology – but does it live up to its own hype? We say yes! We found that it can hold ice and frozen items for 2-3 days, which is more than some of the more expensive options on the market. This bag is simple to use and keeps food cold for a long time. The walls are an impressive 2 inches thick. As a rough estimate, the bag can hold up to 20 cans and some ice. Overall, we’re impressed with the great value of this soft cooler bag. We think the Homitt is a great alternative to some of the bigger brand names out there. However you will need to check over the manufacturing before accepting your bag. Some found the bag may leak, and the zipper is difficult to use – however, a difficult zipper seems to be a common problem with these types of cooler bags. You will also want to rinse the bag out so you’re not offended by the funny ‘new’ smell after opening. 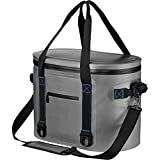 Overall, this is a great cooler for those on a budget, and even those who just want a great soft sided cooler in general! Now, onto the Pelican cooler which obviously comes with a higher end price tag. 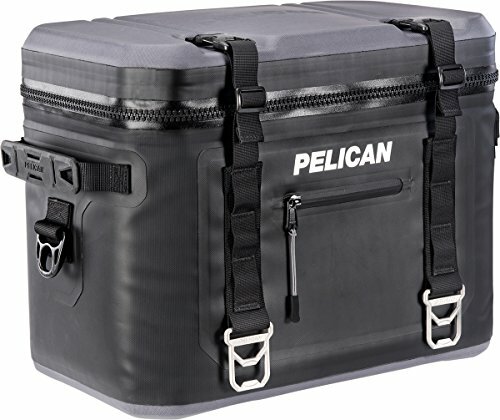 The brand name is slightly more well-known, so those who have a little more to spend often look at Pelican products in the hope of getting a quality cooler. This model comes with the options of 12, 24, and 48 can options depending on the size you need. This sets it apart from the other soft sided coolers on the list. We found that the bag offers 24-36 hours of keeping things cold on average, which is great for grocery shopping and short day trips. Not so good if you’re looking for something to accompany you on your overnight hunting, fishing or camping trips. The bag also comes with a 3 year warranty, which is another unique feature the others don’t seem to have. With the Pelican cooler, ice retention can be OK, but you must ensure that the zipper isn’t allowing condensation to enter the bag which will result in faster melting ice. As with other coolers of this type, the zipper is difficult to use and this can make it tough to keep things cold. When you look at this objectively, the brand may be good, but you can definitely get similar results with a much cheaper cooler like the Hommitt reviewed previously. A black cooler bag? Really? Also, it’s quite surprising that there’s only a black color available – which means it absorbs heat much faster and thus the things in the cooler melt quicker than they need do. Not a great offering from Pelican if we’re honest, but could be worth a try if you want to take advantage of the excellent brand warranty! You’ve spotted the Yeti brand name so you’d be forgiven for thinking that this cooler is the most expensive on the list – and you’d be right. The cooler comes in at a much higher price point than the other two coolers, but is it worth the expense? This model claims to be 100% leak proof that can keep ice for days. The size can hold 24 cans, 6 foot-long subs, or 4 tubs of ice cream, so the size seems great for pretty much any activity you’d like to use it for. On top of this, there are two different colorways that won’t absorb heat, so you don’t have to worry about your items melting too soon. On the downside even on an expensive model like this, the zipper is robust but difficult to use, making it awkward to get in and out of the cooler and retrieve what you’re looking for. 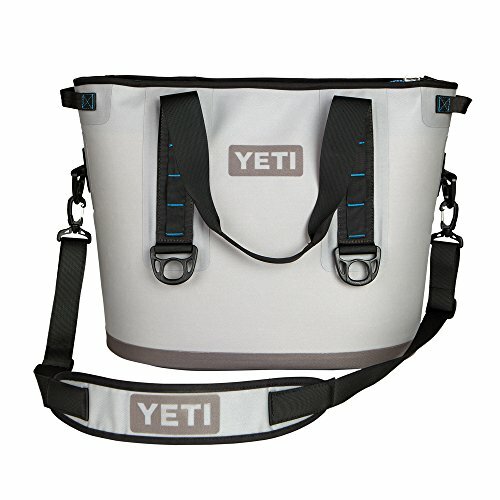 Is the Yeti Hopper range the world’s best soft coolers? Well this Yeti cooler falls a little short when you look at the price point. We feel it’s definitely overpriced for what it does, keeping things cold for a few days at most and definitely not as long as advertised. It can be used for simple grocery shopping, of course. It may also be a good option for fans of the brand, but we can’t recommend it as the best cooler for a variety of activities. Although we think it’s the best looking cooler on the list, it falls short of the mark. Maybe wait until it goes on sale if you’d still like to try this cooler for yourself! The Winner: Which is the Best Soft Sided Cooler of the 3? Drum roll…the Homitt is the best soft sided cooler bag on review. If you’re somebody who wants a fantastic soft sided cooler regardless of brand and aesthetic, this cooler is the most affordable and pretty much does what it says on the tin. Why would you pay 3 times as much when you could get something like this for a fraction of the price that actually works better? Yet some people still want to pay ridiculous money just for a brand name! Sure, the zipper isn’t great, but that is a common gripe with all of these cooler bags. The runner up? It was a tough one, but we have to say the Pelican just pips the Yeti to the post. It was the 3 year brand warranty that did it for us, so if you experience any problems with the Pelican, you have peace of mind. The Pelican might not look the best, or keep things cool for the longest, but it’s a safe option and you have plenty of size options. We’re not out here trying to bash Yeti – quite the opposite. We’ve tested and reviewed many Yeti products, and we know that Yeti is a quality brand with many fans. However, this product does fall short of the mark. It’s not the best soft cooler here. For the price point, you’d expect a much better zipper and opening to avoid awkward retrieval of your goods. You don’t want to feel like something as expensive as this is going to come apart or break! Alternatives just offer more value. Also for the price, you’d expect ice retention for much longer. This cooler is definitely the best looking. If all you care about is the brand and aesthetics, go for it. You just might be a bit disappointed with the performance for the price paid. An issue with all the soft cooler bags we tested here was the zipper. They all snagged or had jerky movement. An easy fix is to give the zipper teeth a light coating of wax. Watch the video below to see how you can do this. Works on any zip not just those on cooler bags.